Howard Daigle, a founder of the firm, retired from the law firm’s practice in December, 2012 after an illustrious and celebrated career as a trial lawyer and the firm’s managing partner. 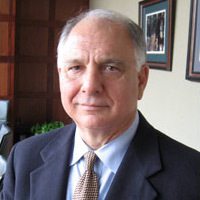 Mr. Daigle was a partner in the New Orleans firm of Phelps Dunbar before moving his practice group to the Northshore in 1993. He specialized in complex products liability litigation; principally representing national and foreign product manufacturers in civil and admiralty litigation throughout the Gulf Coast states (East Texas, Louisiana, Mississippi and Alabama). In his 37 years as a trial advocate, he gained widespread experience in the defense of specialized manufactured products, with a particular emphasis in aircraft, their component parts, and aircraft operators. For many years, Mr. Daigle was general products counsel for Lake Aircraft, directing the defense of Lake Amphibian aircraft in litigation nationwide. He served as Products Liability Advisor to the Small Aircraft Manufacturers Association. Mr. Daigle received his B.S. and J.D. degrees from Louisiana State University, where he was a member of the Order of the Coif, the Louisiana Law Review and Phi Kappa Phi. He is admitted to the Louisiana Bar and numerous Federal District and Appellant Courts, and the United States Supreme Court. Mr. Daigle is a member of the Louisiana Association of Defense Counsel and the New Orleans Association of Defense Counsel. He is a past member of the International Association of Defense Counsel and served in 2000 on the faculty of the IADC Trial Academy. In 2005, Mr. Daigle was recognized by CityBusiness in its inaugural selection of “New Orleans Top 50 Lawyers.” He served on the board of the West St Tammany Chamber and is a past chairman of the Northshore Business Council. Prior to beginning his legal career, Mr. Daigle was a Captain in the United States Air Force, where he served as an F4 Phantom Aircraft Commander in Europe.